If you’re anything like us, you’ve spent countless hours hitting refresh on the American Whitewater river database waiting for your favorite runs to turn green. AW’s river wiki is a great resource and they’ve done a really good job bringing together meaningful gauge data from multiple sources into one convenient location for kayakers. But as the weather warms and rivers start to swell, you might not always think to check the AW page for a certain river, especially if that river is a bit further from home, as is often the case with multi-day trips. The USGS website — the source for the majority of the real-time stream gauges in the USA — has a convenient feature that lets you keep tabs on rivers without having to remember to check the gauges. This article is a step-by-step guide to setting up USGS gauge alerts on relevant gauges for kayak trips. As an example, we’ll be setting this up on the Middle Fork of the Salmon. If you don’t already have a link for the USGS gauge in question, you have two options. 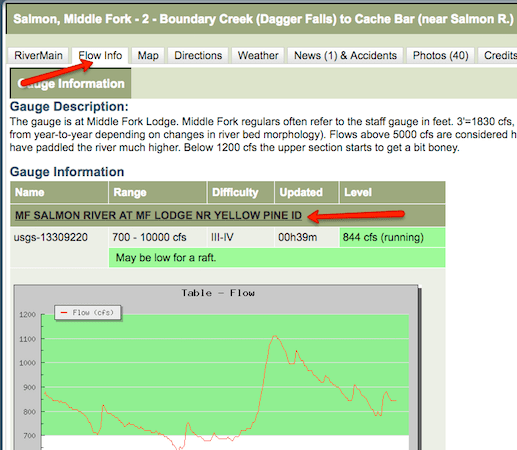 First, head to the AW page for your river, click the “Flow Info” tab, then click on the name of the gauge. On the gauge page, if you see a USGS logo, you’re good to go — click the “Source Gauge’s Page” link. If not, then unfortunately water alerts are not available — it’s a USGS service. 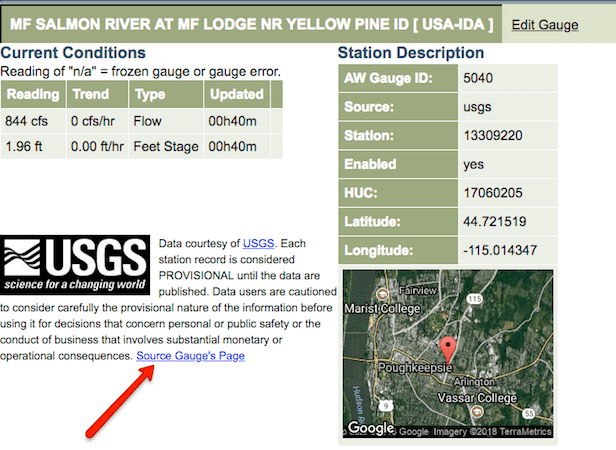 Click the “Source Gauge’s Page” link to head to the USGS. 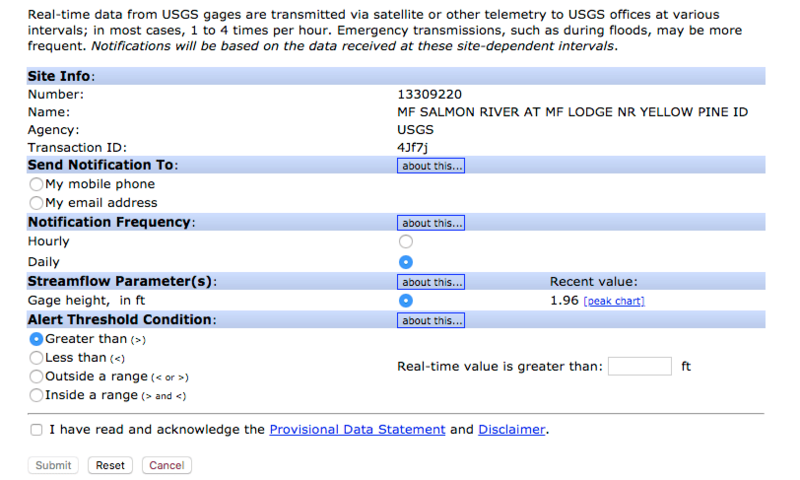 If the river is not in AW’s database, you can head straight to the USGS real-time water data page for your state. Take this URL — “https://waterdata.usgs.gov/id/nwis/rt” — and replace “id” with the lower case abbreviation of the state in question. Each state’s page differs a little bit, but in general, if you click the “Streamflow” link on that page, you’ll come to a list of all real-time USGS flow gauges in the state organized by basin. Find the one relevant to the reach you’re trying to track and click on its ID. Click the “Subscribe to WaterAlert” link. On the Middle Fork, people typically measure flow based on stage, so that’s the metric we’re using for the alert. The form is pretty self-explanatory. It allows you to receive alerts via SMS or email, on a daily basis or hourly basis, and based on a threshold (above or below) or range for flows. Unless you’re using it on a run close to home that you can drive to on a moment’s notice, I usually go for the daily updates and use the threshold (“Greater than”) to define my alert. Subscribing to the water alert is pretty straightforward. 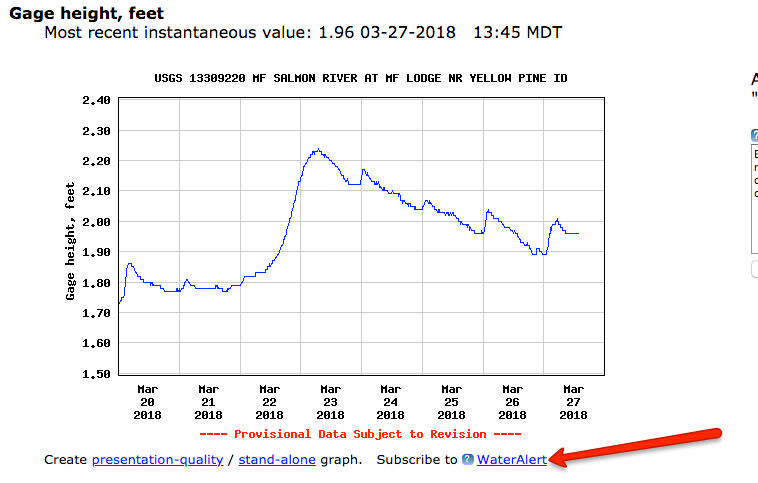 For the Middle Fork of the Salmon, I’d set a threshold of “Greater than 3′” for an alert — that way, it will notify me when the spring melt begins in earnest. On the east coast, it’s pretty much always hard to tell when things are running. USGS alerts allow you to be notified automatically when runs like the Chattooga or Shavers Fork are at ideal flows. In the west, things are a bit more predictable, but when and where the spring melt goes off is quite variable, especially since so many different climates are crammed so close together. The Owyhee, Jarbidge, and Bruneau tend to run in the very early spring — the Owyhee has already gone off this year — but just a few hours away, the Middle Fork of the Salmon really doesn’t get going until spring has sprung. We use a few strategically placed alerts to help us catch the different waves of spring melt. Here are a few valuable ones we recommend setting up if you live within striking distance of any of these rivers. Gauge alerts are as useful for day trips as they are for self-supports, so get out there and make use!